Estion is a small team of experts on electrostatics and particle protection. Based on our combined experience we develop measuring instruments able to perform in-situ measurements, as well as consulting, equipment qualification certifications, and training in these markets. Thomas Sebald founded Estion Technologies KG (equivalent to limited partnership) in 1999 as a consulting firm. For the first few years he ran the company alone, offering his previous experience of nearly 15 years by consulting on protection measures against electrostatic and particle-induced damages. To provide his services he used commercially available handheld measuring instruments. By 2006, the company had grown so much that he hired Heike Müller as Business Manager to maintain the management and organizational side of the business. However, with the advancement of process automation, by 2005 electrostatic charges within manufacturing facilities could no longer be measured with handheld devices. Since no other technology was available, Thomas Sebald decided to build his own. Estion started its process to become a manufacturer of in-situ measuring instruments with the development of the E-Reticle in 2007. This step would have been impossible without the advancements in producing smaller electronics and microprocessors. All the necessary measuring and controlling hardware had become small enough to integrate into a photomask. The first instrument for in-situ measurement of electrostatic charges was born. In addition to product development, Sebald continued his work as a consultant and thereby kept in touch with his customers and their problems. This, combined with the positive feedback the E-Reticle was getting, led to the development of further in-situ measuring instruments. 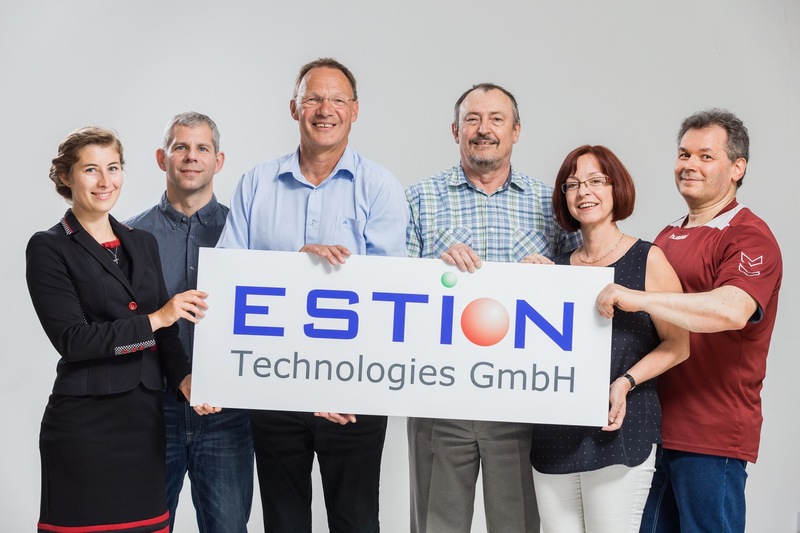 In 2013 the company was transformed into Estion Technologies GmbH (equivalent to LLC). Including Sebald and Müller, the company has grown to 6 employees. Each one of them comes from a different background and has his or her own field of expertise. Due to our size we can be truly creative and innovative. A flat hierarchy allows each team member to pitch their own ideas and to be involved in the development of the company. Our decision-making processes are fast and efficient. A high level of autonomy not only allows each of us to work freely but also to take responsibility for the success of the company and our products. We are a team and we work as one: cooperatively. Joy and vitality are necessary components of our work to be truly innovative. Therefore we provide a positive working atmosphere and a cheerful team spirit. We promote a healthy work-life-balance to give everyone the chance to be their best.